Jiri Horak's friends are clearly better mates than they are poker players. It's great to have friends that support you no matter what, but when Jiri Horak competed in Wednesday’s Poker World Series, his mates were more of a hindrance than a help. 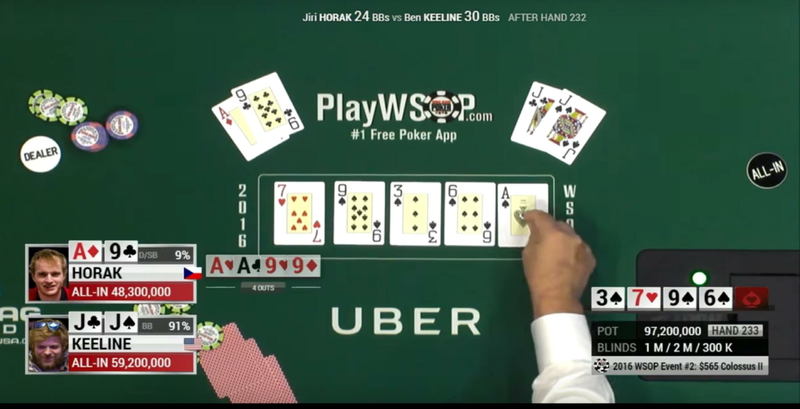 Horak had reached the final round of Colossus II with Ben Keeline, and this footage captured the moment they were about to find out who won the game. With $1million at stake, the competitors could barely stand to look at the table, both turning to their friends and family as the dealer turned over the final cards. But when an ace was revealed, Horak's friends began celebrating his win, despite his friend actually having the losing hand. When it comes to poker, we have to admit that we're not experts, but his mates probably should have waited a bit before celebrating. "His friends thought he won because he had two pairs (aces and nines)," explained arthurspance. "But the other guy had five spades, making it a flush." All's well that ends well though, as For The Win reports that Horak earned a whopping $618,000 for his efforts, no doubt sweetening alleviating his sense of loss considerably.